Applications: Fits Finimaster II using an adaptor, or fits directly to Finimaster 1 and PTX type machines. Cleans rust and leaves a satin finish on aluminium and stainless steel. Product Notes: Open structure, does not clog up. 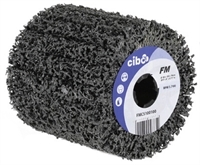 Gives fast aggressive cleaning action. Also Available: We have an extensive selection of machine wheels. If you don't have a finishing machine, we have stripping discs in other forms.